Tuesday, September 12, 1911: Had to run around town this morning and accomplished some errands. Have to sleep with Rufus tonight as the threshers are here. Rufus refers to Grandma’s sister Ruth. The wheat and oats would have been harvested in last July. It would have been tied into shocks and left to dry in the field. Now a threshing machine would separate the grain from the straw. The threshing machine would have been a huge steam operated contraption –and lots of labor was required. The owner of the machine would take it from farm to farm —and all of the farmers in the neighborhood would help. Lots of food would have been needed to feed the men. People in central Pennsylvania used to say that a meal should have seven sweets and seven sours. I wonder if the Muffly women made Spiced Crab Apples for one of the sours to feed the threshers. Here’s the old recipe that I use to make spiced crab apples. In the old days a large amount of spiced crab apples would have been prepared—and some would have been canned. I’ve adapted the recipe to make a smaller amount—and just store them in the refrigerator rather than canning them. Wash crab apples, and remove blossom ends; do not remove stems. Prick each crab apple with a fork several to prevent apple from breaking apart while cooking. Stir vinegar, water, sugar, and spices together in a large saucepan. Bring to a slow boil. Add prepared crab apples and simmer for 15 minutes. Remove from heat and put the mixture into a large glass bowl. Refrigerate overnight. Remove spices from syrup. The crab apples will keep in the refrigerator for several weeks. My husband really likes this recipe. He says that it tastes just like Spiced Crab Apples that his Aunt Gertrude made when he was a child–and that they bring back wonderful memories of sitting in her kitchen eating them. Lynne and Jim–Thank you for the crab apples! Posted on September 12, 2011 August 30, 2015 by SherylPosted in Food, recipesTagged crab apples. Thanks for stopping by. It’s always nice to hear when someone enjoys the site. Such a shame not to be capable of printing off a copy of this recipe!!! Julie, I just printed a copy. What I did: highlight, copy, paste into Word. Works great. I remember planting crab apple trees that my grandfather brought us from the nursery he worked at. Love reading of days when life was slower, and we were all more connected with the land and the growing of things, and the company of animals..
It’s a good way to use what seems like hundreds allllll at once. I’ve never actually canned these, but I’d probably hot pack them in pint jars and then process in a boiling water bath for 5 or 10 minutes. hi Sheryl, As i am reading the recipe today. i find this going to be a 2 day project. as I was reading ,it says to put the mixture in a bowl and put in refrigerator overnight. Then the next day you remove the spices. Oh,I think I am answering my own question . I will then put them back in pan to reheat before putting in jars and putting in water bath canner.So I am going to start this recipe on monday. Yes, I think that you are right–that it would take two days since the spices are supposed to be left in the syrup overnight. I recently made some watermelon rind pickles (you’ll see this in a future post), and it also was a several day process. I have been searching info about crabapples and came across your site. I inherited my Grandmothers old recipes , she was born in 1900, and actually came across one of my childhood favorites, pickled spiced crab apples! I am wanting to buy a crabapple tree but have no clue as to the name or variety I should be looking for. Can you help? Watermelon rind pickles was another one of our favorites too, lol, everytime I mention those to anyone they think I’m crazy! hmm. . . I don’t know what variety of crab apples is the best to use in recipes. A neighbor has a crab applc tree, and he always gives us some that I pickle. Those crab apples are relatively large and it makes them easier to work with. Even if people laugh, watermelon rind pickles are the best! They don’t know what they are missing. I make a batch or two every year. I was looking for pickled crab apples and found your delightful blog! My Grandmother lived to 108, so these recipes remind me so much of things she made. Eager to try this recipe and can it too! Thanks for taking a moment to write this nice note. It’s always wonderful to hear when someone enjoys this blog. Thank you for sharing. My aunt and I just picked up crab apples this past weekend from up home. I am looking for a “pickling” recipe but not a sweet one. I think though that I am going to try this recipe with some of my “booty”. The good ole days, yes indeed! I did the r ecipe here but I double the ingredients and got 2 pints and 4 half pints,I waterbathed them for 15 minutes. i found one in my Ball Blue Book but it was sweeter then the 100 year old. Thanks for the update and the information about how much it made. It’s interesting how the recipes varied. I think you’ll like this recipe if you want one that is not too sweet. My brother is always asking me for Crab Apple recipes. How to can them, bake with them, etc… I now know where to send him 🙂 Thank you!! Thanks so much for the great recipe…brings back wonderful memories of my own grandmother, also named Helena, born in 1886. Also really enjoying your site in general. I think the world would be a better place if we could all go back to that way of life! I’ve never had a crabapple, but it sounds delicious! I think that people today tend to eat a narrower range of fruits and vegetables than they once did. Around here crab apples are primarily planted for their lovely spring flowers, but a few of us still eat foods made from them. I agree with you – and it seems as if a lot of people only eat fast food which I guess isn’t even really food a lot of the time. Oh Sheryl, I am so excited about making the pickled crabapples! I have a tree loaded with them. This recipe sounds so delicious! Just have to find some crab apples. I love using old recipes. It keeps the memories alive. Glad you liked it. Hi Sheryl! I had a recipe blog in WordPress but I recently deleted it. I have one on Blogspot, my original one, and it was hard keeping up two of them. I also have two Book Reader Blogs, one on each website (To get more readers) but I’m not so sure I like copying and pasting from one to the other. I may just delete the Book Reader blog on Blogspot today. I must say that I enjoy old recipes. I have my Great Grandma Jone’s AMERICAN FAMILY COOKBOOK and I post recipes from it as it was published. Meaning, it’s in sentence form. The box that holds the book also comes with many old handwritten recipes. I enjoy another recipe blog in here that posts mideval recipes. Have you seen it? I’ll have to peruse your blog when I get home tomorrow. I hate this old laptop I use at my daughters, preferring a large PC screen and a mouse! Posting the old recipes from the cookbook sounds like fun. I always enjoy trying to decipher the old sentence-style recipes. I hadn’t known about the blog that posted medieval recipes until I read your comment, but after I read it I googled it, and think I found the blog you were referring to. I really like how that blog had the original recipe, the translated recipe, and the updated version for modern cooks. Hi! I have never tried Pickled Crabapples. Do you eat the whole apple after they’re pickled?? Or do you remove the core?? I have a boat load of Crabapples from my tree and need to use them up. Thanks!! No, I don’t eat the cores after they are pickled. I just eat the rest of the apple and throw out the core. I found some fresh crabapples at my local grocery store – first time I’ve ever seen them. I made this recipe yesterday, and they were incredible! So yummy! 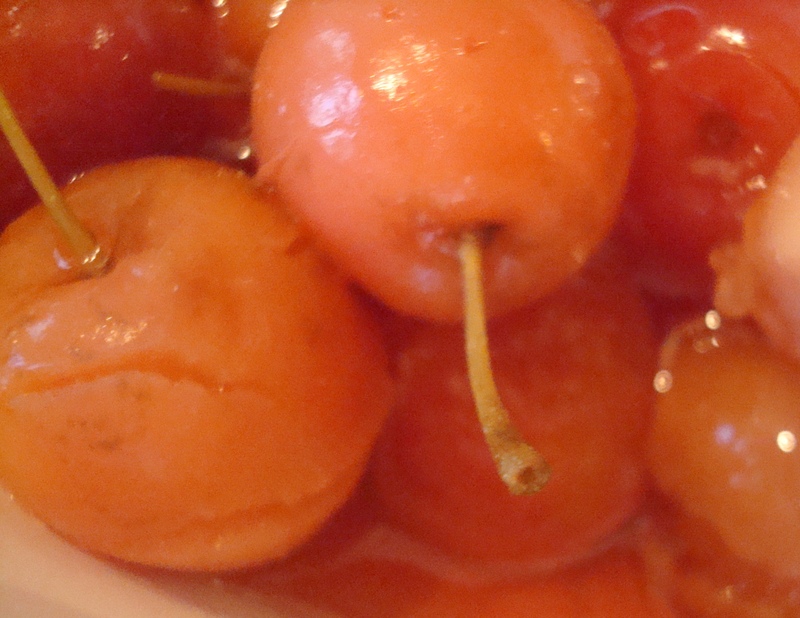 My mom used to buy jarred crabapples when I was a child, but I don’t see them in stores anymore. These were so simple and easy to make, I will make them again and again. Thanks for a great recipe! It’s wonderful to hear that you enjoyed this recipe. It’s awesome that you found some crab apples at a store. I don’t think that I’ve ever seen them in a store. ad!! prepped just like u said, but the minute they hit the water half of them exploded. They must’ve been too ripe??? Next time i’ll make applesauce! Hmm. . . I’m not sure. Did you prick them with a fork before putting in the syrup? When making Pickled Crab Apples, they will start to fall apart if overcooked. It’s a balancing act to cook enough, without overcooking. When I make Pickled Crab Apples, I usually cook them until the skins start peeling off a couple of the apples (which indicates that they are becoming overcooked), and then quickly remove from the heat. So glad to find this recipe and this site. My great grandmother, a woman we called Banny, made crab apple pickles every year and I loved them. I’m going to give your recipe a try today. I think that you’ll like this recipe. I’m keeping my fingers crossed that these Pickled Crab Apples taste like the ones your great grandmother made.